The weather once again played a major factor in Friday night’s action this week, but for the most part, we were only dealing with wet playing conditions. There were a few games moved from Friday to be played in the next couple of days, but most games were able to be completed on Friday night. 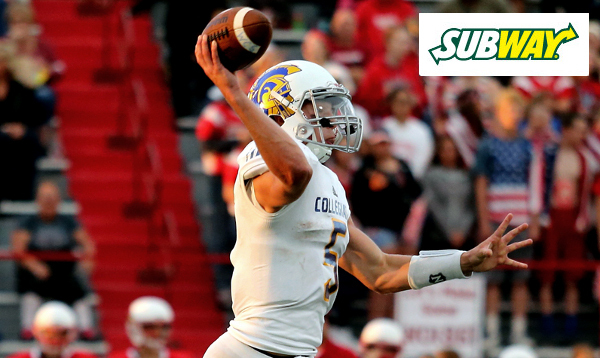 The first installment of the Sunflower-Suburban Showdown pitting teams between the Sunflower League in Kansas and the Suburban Conference in Missouri ended up one-sided. Missouri schools won all ten of the match-ups the showcase featuring those two leagues, and overall, Missouri schools went 15-0 against Kansas schools this week. Is the brand of football really that much better over the state line? Or is the fact that Missouri schools have each played two more games than Kansas schools this season, and are allowed much more freedom in the summer the deciding factor? While Kansas schools had their struggles with Missouri teams in Week 3, the Garden Plain Owls knocked off Kearney Catholic, ranked No. 7 in Nebraska Class C-1 football, 29-20. The Owls trailed Kearney Catholic 20-14 at halftime, but outscored the Stars 15-0 in the second half to get the win. Nate Pauly once again led Garden Plain to victory. The senior carried 26 times for 144 yards and four touchdowns. Pauly also pulled down one of two Owl interceptions of Kearney Catholic quarterback Matt Masker. Masker finished the game 26 of 33 for 268 yards and a pair of touchdowns. Garden Plain held Catholic to six rushing yards on 13 carries for the game. The Andale Indians held off the Mulvane Wildcats 61-52 in a wild game that featured 113 points and well over 1,000 yards of combined total offense. Mulvane’s Zach Helbing’s 90-yard touchdown return on the game’s opening kickoff was only the beginning. Andale would answer right back on a touchdown pass from quarterback Taylor Richter to Tristen Dagenais. The quarterbacks would then get involved as Mulvane’s Jayden Price broke a 50-yard touchdown run followed by Richter’s 45-yard run to tie the game at 14 after the first quarter. Andale would take the lead on a Dagenais run (get used to reading that), before Price scored again to tie it a 21. The teams traded touchdowns again in the second quarter, with each missing their PAT. Dagenais would score from 28 yards out to give Andale a 34-27 lead, but Mulvane could only answer with a field goal to pull within 34-30 at halftime. Richter scored to put Andale up 41-30, but Keaton Shoemaker returned the ensuing kickoff for a touchdown to pull Mulvane within 41-38. Consecutive Andale touchdowns extended the lead to 55-38 before Mulvane pulled to within 55-52 mid-way through the fourth quarter. Andale would answer with a long, time-consuming drive in which Mulvane eventually allowed Dagenais to score with 2:20 left just to get the ball back. Andale rushed for nearly 500 yards on the night, led by Dagenais’ 223 yards and five touchdowns. Price led Mulvane with 202 passing yards, 180 yards rushing, and four touchdowns. The Eastern Kansas League was host to another feature showdown this week as Class 5A’s No. 2 St. Thomas Aquinas Saints traveled to take on Class 4A-I’s No.1 Bishop Miege Stags. Aquinas jumped out to a 7-0 lead after driving 80 yards in nearly seven minutes and scoring on a Drew Hicks short touchdown run. Miege would answer right back when freshman running back Brison Cobbins broke a 57-yard touchdown run to tie the game. Aquinas then fumbled on its next possession, and Stag quarterback Carter Putz hit Joseph Gleason on a 10-yard touchdown pass for a 13-7 lead. Aquinas fumbled again, this time, Gleason recovered the ball in the end zone to give Miege a 20-7 lead. The Stags would extend their lead to 34-14 by halftime on a long touchdown run by TaVon Tusa and a Cobbins’ touchdown reception from Putz. Miege All-State wide receiver Jafar Armstrong returned a kickoff for a 75-yard touchdown immediately following an Aquinas score in the second half. After falling 31-22 on the road at Hoisington a week ago, Wichita Collegiate left little doubt in a road test this week at Buhler. The Spartans scored 24 points in the first quarter and raced out to a 38-7 halftime lead in thrashing Buhler, 45-21. Collegiate quarterback Cody McNerney passed for 320 yards and five touchdowns in helping the Spartans build an insurmountable lead. McNerney tossed a pair of touchdown passes to Jad Hourani, sandwiched around a Buhler lost fumble, to give the Spartans a 14-0 lead. A second Buhler turnover led to more Collegiate points as Cooper Root returned an interception for a touchdown. Collegiate added a field goal for the 24 first-quarter points. McNerney added touchdown passes to Root and jack Larsen in the second quarter as Collegiate built a 31-point halftime advantage. He connected with Root on another touchdown pass in the third quarter. Buhler only managed 97 rush yards on the game, led by Dalton Brown’s 71 yards. Brown rushed for two scores and caught a touchdown pass from Ethan White for the Crusaders’ points. Hourani caught ten passes for 140 yards and two scores for Collegiate. Colby moved to 3-0 with a 24-21 road win over 4A-II No. 5 Hugoton. The Eagles took a two-score lead on a 19-yard touchdown pass from Zach Hart to Donte Whitfield mid-way through the fourth quarter to make the score 24-14. Hugoton tried to mount a drive, but the Eagle defense forced a turnover on downs with 4:15 remaining. Hugoton would tack on a late touchdown with 1:15 left on a pass from Valentino Degollado to Zack Leininger, but Colby would recover the onside kick and exhaust the clock. After a scoreless first quarter, Colby took the lead on a touchdown run by sophomore Jordan Schippers. Hugoton answered when Degollado threw a touchdown pass to Braden Slemp . The two-point conversion made it 8-7 Hugoton. Colby would add a 25-yard field goal by Juan Diego Mediavilla-Saiz for a 10-8 halftime lead. Hugoton regained the lead 14-10 after Degollado rushed for a short touchdown in the third quarter. Colby would respond as Whitfield caught a touchdown pass from Hart to lead 17-14. Nemaha Central quarterback Ryan Hasenkamp scored on a 1-yard run with less than a minute to go to pull the Thunder within 42-41 of Holton. Then it was decision time. Thunder coach Warren Seitz decided to go for the two-point conversion and the win considering his team had struggled to slow down the Hotlon ground game all night. In a back-and-forth game, Holton seemed to be control. Spencer Baum’s touchdown in the fourth quarter gave Holton a seemingly comfortable 34-21 lead. But the Thunder would respond with a pair of quick touchdowns sandwiched around a defensive stop to take a 35-34 lead. Baum put Holton right back on top with a 72-yard touchdown run. After the two-point conversion, the Wildcats led 42-35 with under five minutes remaining. But Nemaha Central drove the length of the field and Hasenkamp scored with 37 seconds left. Holton rushed for 544 yards in the game led by Baum’s 197 yards and Miles McClintock-Strozier’s 232 yards on 11 carries. Hasenkamp passed for 215 yards to lead the Thunder. Holton (0-3) has now lost four consecutive games including the Class 4A-II state title game last fall. The Great Bend Panthers solidified their spot in the Class 5A rankings with a 58-47 road win at Wichita Northwest on Friday night. Great Bend scored 41 points in the first half against a porous Gizzly defense that has allowed 160 points in three games. Panther quarterback Jacob Murray rushed for three touchdowns and threw three touchdown passes to Bryce Lytle in the first half as Great Bend built a 41-27 lead. The second half began with more of the same; a 21-yard touchdown pass from Murray to Lytle to put the Panthers up 48-27. Wichita Northwest would respond with a 42-yard touchdown run by Jahlyl Rounds to pull within 48-33. Rounds had a monster night in rushing for 237 yards and five touchdowns for the Grizzlies. A Great Bend field goal would extend the lead to 51-33 after three quarters. Rounds would pull the Grizzlies to within 51-47 with a pair of fourth-quarter touchdowns before Cal Marshall scored from 19 yards out for the 58-47 lead. Murray rushed for 138 yards and three scores, and passed for 284 yards and four touchdowns. Lytle caught eight passes for 180 yards and four scores, while Marshall led the Panthers with 153 rushing yards. Austin Anderson threw for 256 yards and two touchdowns to Martese Mullins for Northwest. Mullins caught five for 140 yards. The Plainville Cardinals were perhaps the biggest story of the opening two weeks of the Kansas high school football season. Plainville has posted close wins over ranked opponents in Smith Center (20-16) and Norton (20-14). But the Cardinals first road test on Friday night ended with a 31-16 loss to the Phillipsburg Panthers, the defending Class 2-1A champions who have moved up to Class 3A this fall. Phillipsburg sacked Plainville quarterback Hayden Friend in the end zone for a safety and a 2-0 lead to start the scoring. Friend would find Dylan Wallace for a touchdown and an 8-2 Plainville lead after one quarter. The score would remain 8-2 until John Gower scored on a short run with less than five minutes remaining in the first half to put the Panthers up 9-8. Phillipsburg would add another second-quarter touchdown on a run by Mark Coomes from midfield to lead 16-8 at the break. The Panthers would expand their lead to 24-8 on a Kirk Coomes 35-yard run late in the third quarter. As they’ve done the first two weeks, the Panthers slowly pulled away as Kirk Coomes scored again mid-way through the fourth quarter for a 31-8 lead. Plainville and Friend would tack on a late touchdown pass to pull within 31-16 late. The Panther defense held Plainville to only 67 rush yards on 38 attempts.